Most would assume that in order to do their bit of good and change the world, they would need to move mountains and go the extra mile. It is a common misconception that to do our part and leave our footprint in our community and the world, we have to up and leave our own comfort zone and make huge sacrifices. This is not the case at all. In fact, the co-founders of local social enterprise based startup, Life is Awesome understood this principle very well. This is because the team of two, made out of John and Evie, try to make their own version of a difference in this world by designing something as simple as a plain ol’ tee. 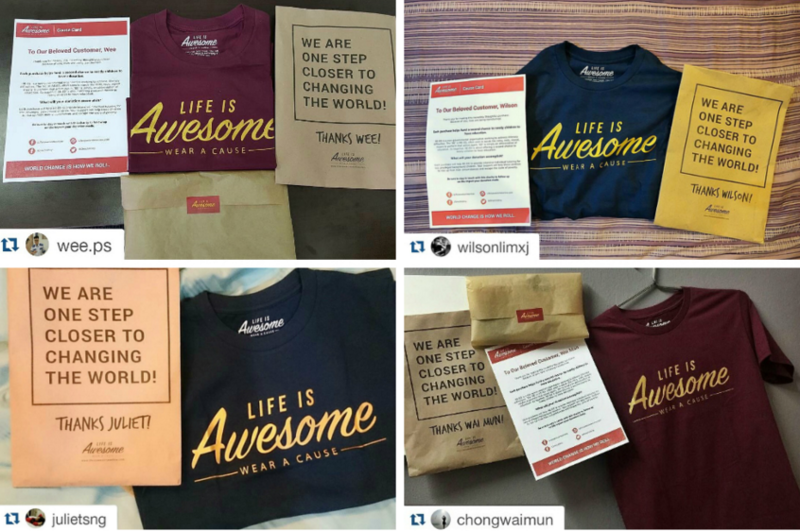 It all started when John got a T-shirt with the phrase ‘I am Awesome’ on it, from Taiwan. “People started getting the good vibes from John’s tee, asking where did he get the shirt from. So the Life is Awesome idea came around when we tried to incorporate the tee design to solve a social problem, by spreading good vibes, raising capital and awareness for social causes,” Evie said. Life Is Awesome is an organic funding movement to raise capital and awareness for the world’s greatest causes. Every month, the startup partners with a new non-profit organisation, and design a unique tee to reflect the mission of the specific organisation. 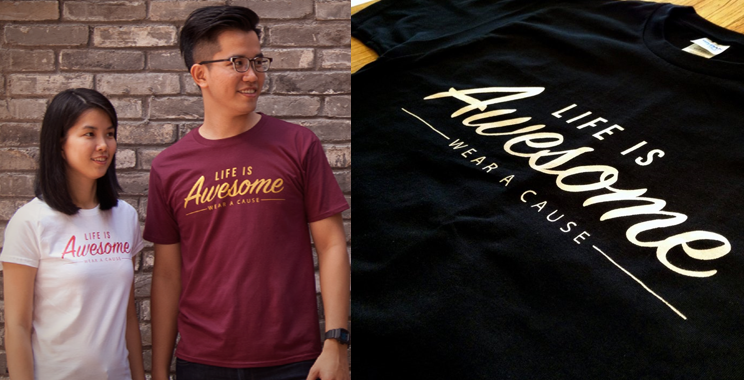 For every tee sold, Life Is Awesome will donate RM5 directly to that month’s charity. The team at Life is Awesome designs the tees themselves upon discussion with the non-profit organisations in order to reflect the correct messages on the tees. As for printing, they have their own supplier to do the printing for them. Likewise, the partnered non-profit organisation plays their part in supporting Life is Awesome by sharing with the team their basic organisation information, as well as sharing the campaign on their Facebook page, website or database. While it may sound like a simple concept, both John and Evie believes that one does not have to be “a globe-trotting warrior building houses or saving polar bears”, as Evie puts it. “Sometimes, a little goes a long way, start by wearing a cause, bring much-needed awareness to the communities or social movements you care about, and take heart in knowing that your sartorial choice is actually making a fashionable and positive statement,” she said. Donors can take pride in their contribution and support their chosen causes. Also, by donning the Life is Awesome tees, donors are unequivocally giving the loudest voices to causes they are passionate about. “With Life Is Awesome, we look forward to transcend the gap between non and for-profits. We believe goodness can be derived from every action, and thus the seemingly innocuous act of selling and buying tees can be re-engineered into a meaningful contribution to society,” Evie shared. Ultimately, their mission is a simple one, and that is to elevate the lives that they touch and improve the world by raising public awareness and capital for causes in need. If all that it takes to leave our footprint in this world is the simple act of purchasing a piece of fashion statement and donning them, then perhaps it won’t be too far-fetched to believe that all of us could play our part and make even the slightest bit of difference.